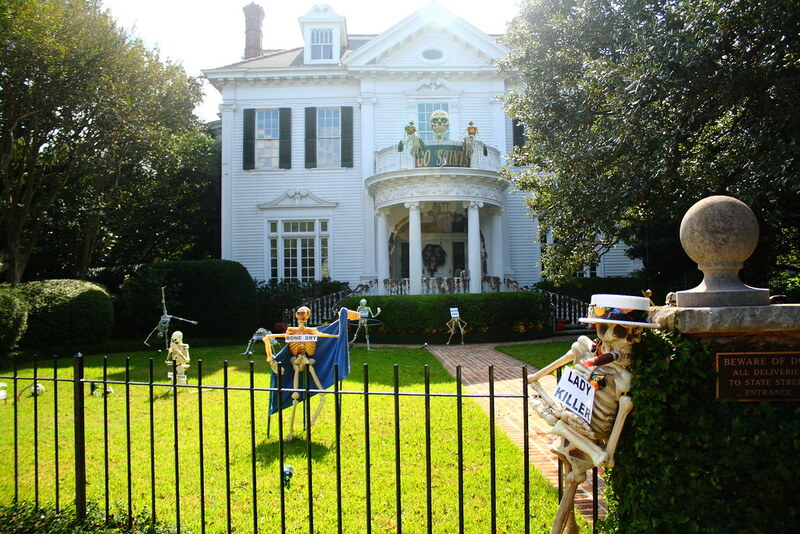 One of my favorite things about New Orleans is that the whole city goes all out for Halloween. 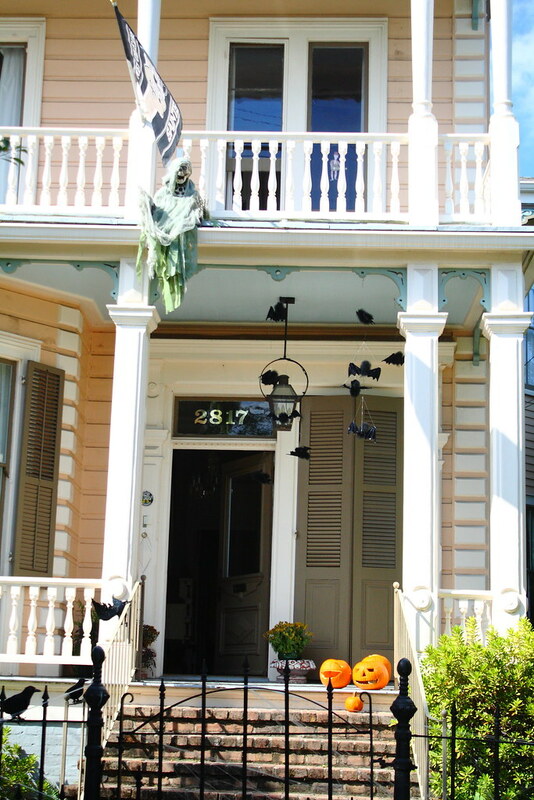 Seeing all of the beautiful old houses decked out with equally macabre and whimsical touches just makes me smile. Obviously this house takes the cake (or candy – zing!). WOw, love the photos and your costumes are fantastic! 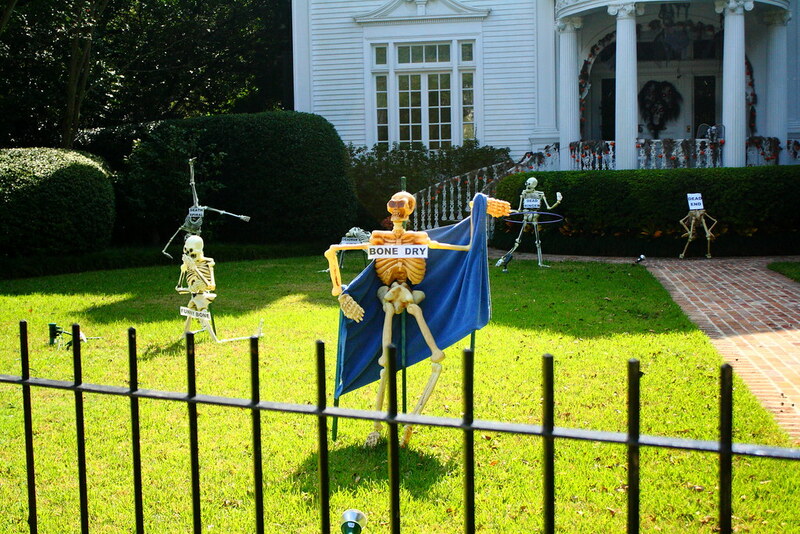 I think the skeleton posed as The Scream is my favorite. But the reclining/snoozing Lazy Bones is a very close second! Great costumes, too! I bet it was bunches of nutty fun in N.O. last weekend. wow, New Orleans does go all out. Some of the skeleton poses are pretty fun. wow, new orleans is all decked out! 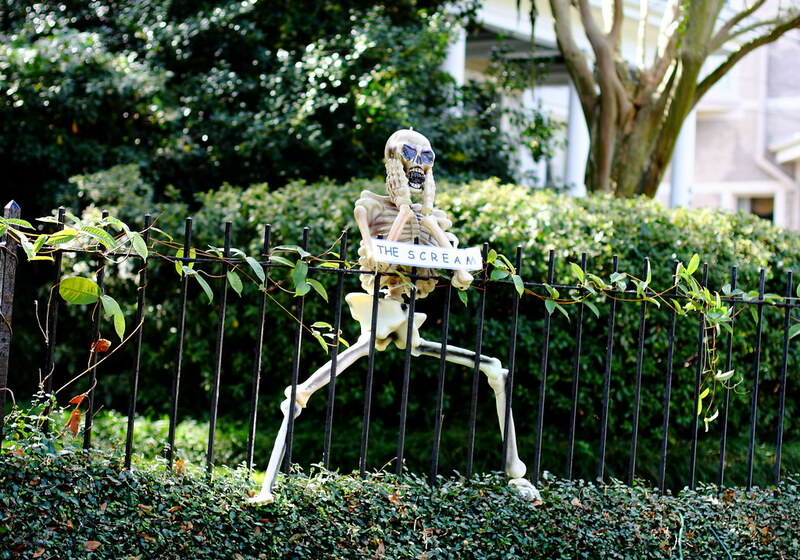 really like the skeleton decorations…whoot! ps. love your costumes! beetle juice was cool! 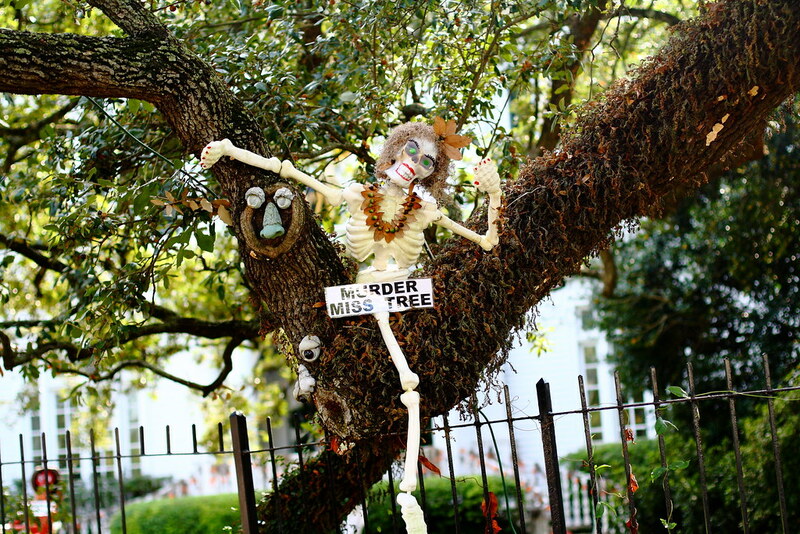 Wow, I'd love to visit New Orleans for Halloween…noone ever really decorates anywhere here. I wish people decorated their homes like this in England, but alas they don't do anything. I was too lazy to do anything for Halloween but I've loved looking at people's blogs to see what they wore 😀 Your costumes look amazing! Love, love, love these pics and great costumes! Love it! My boyfriend was beetlejuice and I was pippy longtocking. I like seeing this as a couple costume. Very nice. Aaahh!! I love it! I thought the "Bone Dry" one was a flasher at first. Your pictures are fabulous ! They did such an amazing job decorating this home…. Halloween is my favorite holiday! Thanks for sharing these photos. Oh my gosh, i can't even tell you how sweet this is, so I won't even try. Oh wait: this is AWESOME. Too amazing. And the photos of the mansion(s?) are gorgeous, too. I'm so jealous. SO. Love it love it love it. I adore decorations of all kinds and unfortunately since I live in an apartment, I never do it. Those homes are amazing! i have had the pleasure (and luck) to be able to visit new orleans twice in my life and have vowed that one day i WILL make it my home. thanks for the goal-inducing reminder with today's pics. Oh snaz! 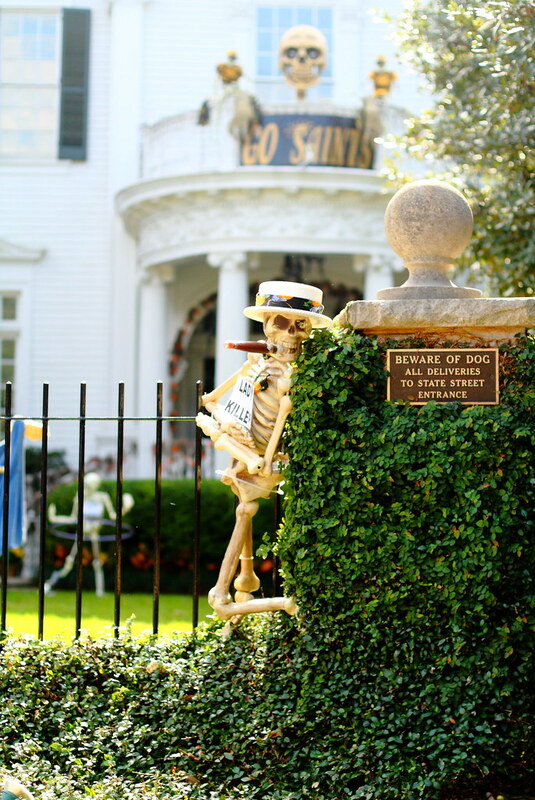 Such awesome decorations and.. and your costumes! BEETLEJUICE BEETLEJUICE. :D! Aww you guys look great!!! And I love all those decorations! E! This is my favorite halloween post of them all! how unique:) i love seeing how new orleans decks out the city for the holiday. how fantastic! The Halloween pictures are really cute! I think your costumes were really unique! Good job! You make such a great Lydia. Wow, I can't believe how many skeletons those people have. ahh I love it! you & your man look great. & new orleans looks so fun for halloween! 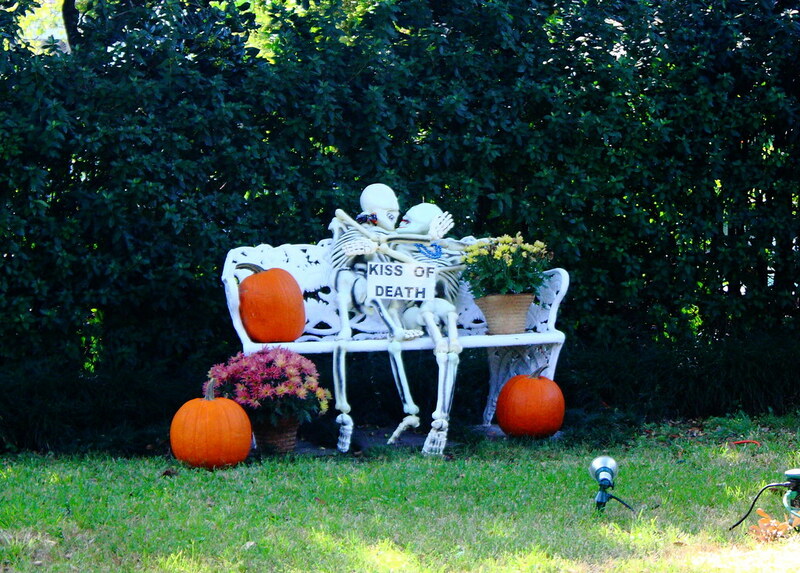 I love how they labeled the skeletons – I think the kiss of death is my favorite! You make a fab Lydia! Ahhhh! Amazing outfits! And it's creative to boot 🙂 You certainly look fantastic. 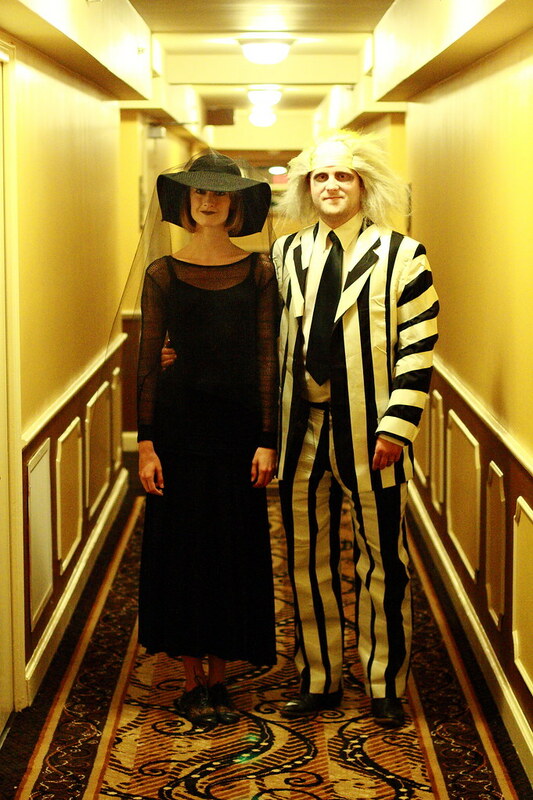 OOOO wow beetlejuice, awesome costumes. I'm dying to go to New Orleans, i really want to visit the Creole Creamery! What fun! 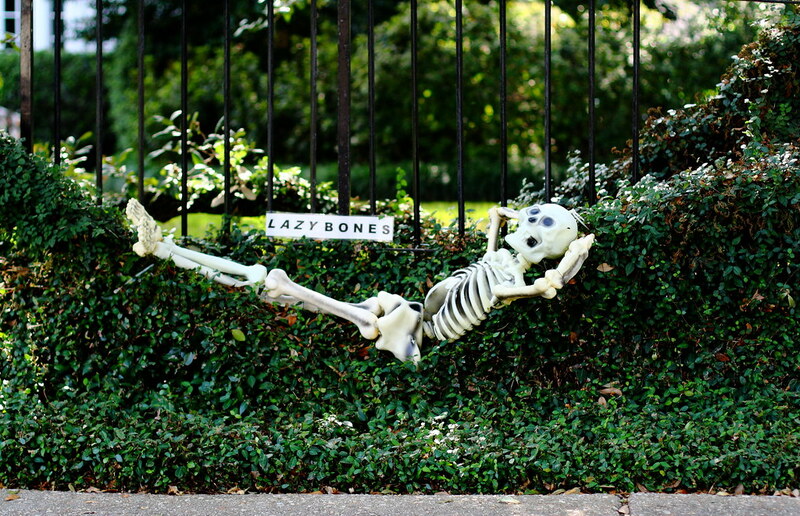 Lazy bones and the skeleton in the hula hoop catch my eye. Fun decorations!! Great costumes, too! Great photos. You guys look awesome in your costumes. goodness! it really looks exactly like american movies…hehe! and nice costumes! thanks for your comment, and I'll keep ya posted. AWESOME costumes!!! And yes, what a great house! I went trick or treating with my son this year (for the first time) and it was so fun when the houses were all decked out!! Oh your costumes are fantastic!!!! I know I"m a bit late stopping by, but I'm glad I did!!! I love those yard decorations you've pictured, too. They are just awesome!!!! OH my gosh I had no idea you went to NOLA! I'm so jealous. Love your costumes! and your costumes are amazing!!! you both look so good!! aahh!! 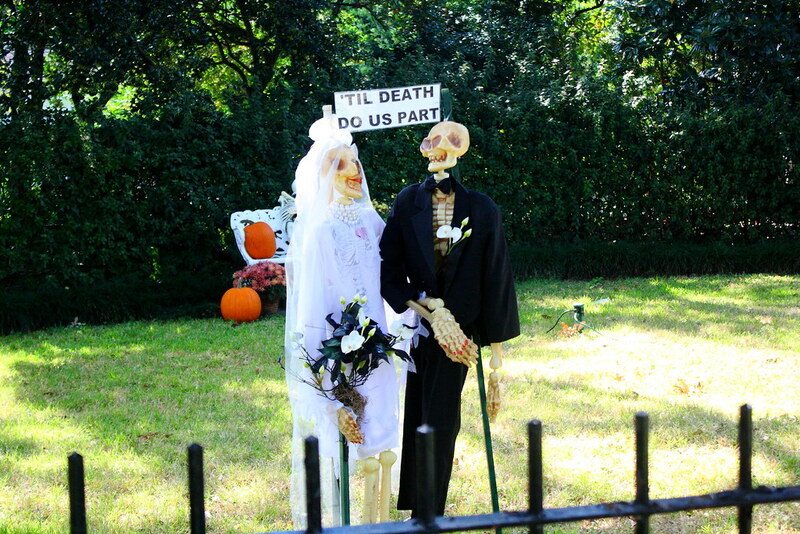 Love that the Halloween decoration are all kind of funny and tongue in chic. I mean, cheek. You and the guy look great! Where did you take all these beautiful pictures? Halloween is definitely in my top 3 holidays! Your couples costume is so classic. I'm just now catching up with my blogroll so please excuse the delay. I have to say that this is the best costume. Really and truly. I am a HUGE Beetlejuice fan. I agree about N.O. 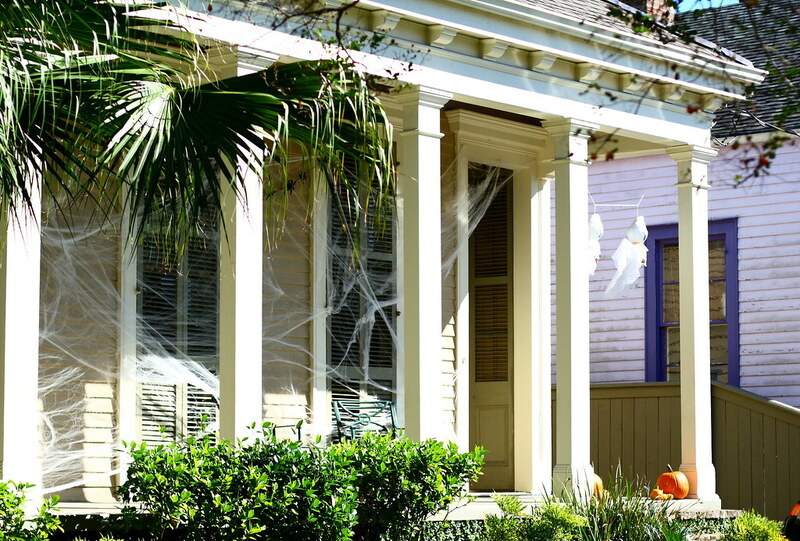 New Orleans at Halloween is beyond amazing. It's really quite a surreal experience. Makes me miss that city. Haven't made my yearly trip back yet.